Now, the quintessential iconic Ferrari 250 GTO is surely one of those cars that needs no introduction but if all you know is that it fetches record prices ($18/£12 million on the top end. Anyone?) you may be curious about the story behind the car—and wince at the fact that there really was a time when you (almost) couldn’t give them away! Built strictly for racing, the 250 GTO dominated its classes during its short but history making run from 1962 to 1964. And, most definitely a rare claim to fame, all 39 production cars—despite almost all of them having been raced—still exist. In 2011 the Pebble Beach Concours will call them all together to constitute one of the featured classes. The author likewise should need no introduction. 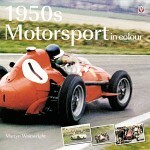 For 50 years he has written motoring books, with an emphasis on Ferrari in particular and 1950s and ‘60s motor racing in general. He also raced himself, at the club level, in the 1960s. Retired now for a few years from a professional life of lawyering, in his “years of leisure” he will surely only add to his already 60-odd books. Good for him and very good for us readers. Well written and very readable, this is your typical Haynes production: large format, glossy paper, intelligent typesetting and design, a proper book in every respect. 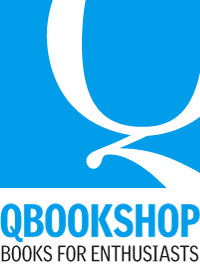 If you know the previous magnum opus on the subject, Ferrari 250 GTO by Keith Bluemel and Jess G. Pourret (1998, Bay View Books Ltd., ISBN-13: 978-1901432152. Good luck finding one used for under $300. ), realize that Pritchard’s is more than twice as long and contains quite a number of new photos and complete coverage of every prototype and production chassis. 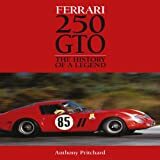 Principally divided into racing history and chassis history, the first part contains a prequel about the 250 Gran Turismo cars as a whole and the 1959–61 short-wheelbase 250 GTs before examining the design and evolution of the GTO. Some 10 pages look at specific details of construction, components and trim, suitably illustrated with close-ups by Tim Andrews. A splendid full-color two-page cutaway shows an elevated front ¾ view of the innards of Nick Mason’s GTO. (Segue: Read Pink Floyd drummer Mason’s Into the Red: 22 Classic Cars That Shaped a Century of Motor Sport to see how serious he is about race cars!) 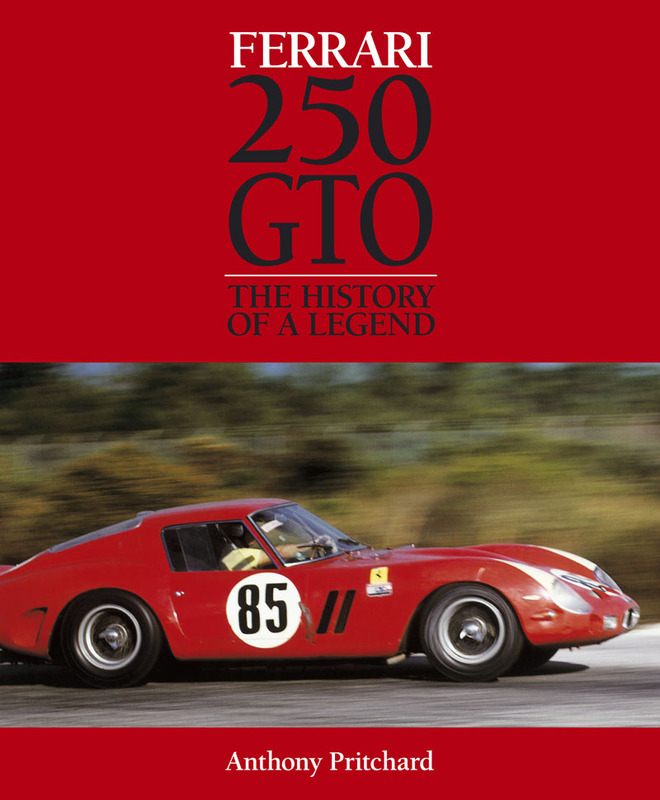 After that, it’s off to the races, one chapter per year, with a final chapter about the 275GTB. Each year is introduced with a basic overview of the state of racing and prevailing regulations. Each event during the year is then covered in varying degrees of detail, depending on its importance. The top three finishers in the championship are listed. Occasional sidebars dispense information about the Lusso, competitors’ cars, background re. the 1965 CSI refusal to homologate the 275GTB that resulted in the Shelby Cobras having an uncontested season etc. A Postscript addressing the causes for the demise of the 250GT is the bridge to the remaining third of the book. Here, every single chassis is presented, each on one to several pages, delineating build and ownership history . (It should be said that the author made a conscious choice to allow the modern ownership history to be less detailed than the early history, arguing that there is no intrinsic relevance to the model history in the former. Readers 20 years from now will probably curse him.) Tables list every competition event by date, driver, location, and result. Sidebars in this section contain reminiscences by owners/drivers David Piper, Michael Salmon, Peter Sutcliffe, and Jack Sears. Two closing chapters cover the Breadvan/s (with possibly some contrarian details) and other GTO bodies on the swb chassis. The book is extensively illustrated throughout with large, clear, thoroughly captioned photos , all of which are credited and about 1/3 in color. Appended are very extensive specs and 1962–65 race results that also show the results of the GTO’s archnemesis, the Shelby American Cobra whose competition history is inextricably intertwined with that of the GTO. A very short Bibliography and a thorough Index cap things off. Your Ferrari literature will be seriously incomplete without this book. A definite example of a mistake is that the name of Luigi Chinetti’s wife is sometimes given as Maisie [wrong] and Marnie (Spears Reynolds). One of her five index refs. is also wrong (p. 152 instead of 154), as are others. Probably a glitch: a caption on p. 149 re. 1963 Goodwood Tourist Trophy refers to an Aston Martin DB4GT Zagato but the two works Astons entered were DP214s.